This is our Alphabet Puzzle. It is a great puzzle for practice with the alphabet because it shows a community and community members that work. This sparks interest and discussion while putting it together. Joey is not interested in doing activities that he thinks are learning activities. So he is able to have fun and practice motor skills while still learning identifying the letters of the alphabet. Now I helped Joey find the next letter by singing the ABCs. I was also able to help him find letters by telling him what the picture looked like. Ie: M is a mailman look for the mailman, now look at the letter at the top, that is an M. There it is complete. Joey would not be able to do this alone but was more than willing to do it with me! Eventually he will be able to do it alone! I gave Jack our color buckets again. (Target dollar station) and some sponge fish. We stuck to 4 colors this time. I modeled how to match the color to the box then placed them in the box saying the color. He did it with a little guidance then quickly lost interest and carried around the boxes to play. He used the fish to dump and refill the boxes. Sometimes he would put them in the coordinating boxes other times he would not. The whole activity lasted about 5 minutes. Joey and I worked on letter recognition and letter sounds with this easy game. (Link to site on week two plans) I wrote the letters into the colored circles. We rolled a die and moved our pieces to the letter. Once on the letter we said the letter name and the sound or a word that started with that letter. This was as much a number activity as a letter activity. Counting the dots on the die and counting the spots on the game board. The whole game took about 10 minutes. We are getting into Week 2 of our summer Structured Play activities. Here are our plans, we are continuing with the Beach Theme. One of the activities we are doing this summer with my big boy (5 year old), is a sight word book (Pre-K, Kindergarten) in preparation for kindergarten. I bought this printable book on Teachers Pay Teachers. This is a great site where teachers provide the work they have done either for free or a small amount. Once you buy the printable you print and have the child cut and glue the pages into a notebook. This is a great resource because it builds not only sight word recognition but also gives them an opportunity to cut, glue and color. Today we worked on motor skills. Jack had to feed the frog! I used an old Parmesan cheese container, drew a face and grabbed some craft balls we had on hand. He loved it! He practiced putting the balls through the whole and even added opening and closing the "mouth" each time. He got silly and said the frog was eating his fingers! This is a sign of success! When a child takes a skill building activity and expands the play creating a game and getting "lost" in play, that is when you know learning is happening. Big brother even wanted a turn! 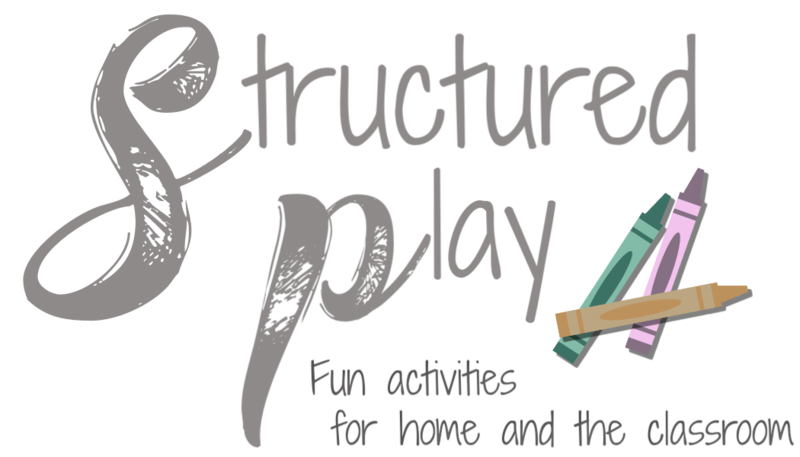 This is the definition of Structured Play! They are learning through play. You take a little for thought preparing a skill building activity and let them go from there! I set three color buckets out for Jack (22 months). We sorted color cards into the buckets. This was his first time trying this activity so I worked with him and was very slow and deliberate with my words. I pointed to the color on the bucket and to the color on the picture card. I kept repeating "match." Although I have many color buckets, I only started with 3 as to not overwhelm. I would pick a card, say the picture, then say the color. I read an article on toddlers learning vocabulary and a key take away was to make the last word, the most important word they are learning. So we were learning/practicing colors, the color needed to be the last word. (Not typical in English language.) "Jack you have a duck. Duck is yellow. Find the bucket, yellow, where is yellow?" All the while pointing to the duck and then the yellow bucket being careful to articulate yellow. With three boys Structured Play time is a little difficult but Jack (the baby) is old enough that we start getting things done all together. The Blue boxes are the activities the children will do with me. While I am working with one of the boys, the other two will have an activity that they can work on alone. I will be right there with them so if someone has a question or needs help I will be there but I will be working one-on-one with one for the most part. I will work hard to do posting of each activity but have linked to activities that I have done before so you can see the general idea. If it is an activity I have sourced, I added the link to the original source. This will be our basic schedule for the summer. Some days may be different but I like to have a general plan because the kids thrive on routine. This is the last summer before Jacob starts kindergarten. I want to make sure we do all the fun things we can do before school starts. The content on this blog belongs to the author. Links to this blog and it's posts are always welcome, but please do not copy images or text for use on other sites without permission. Thank you!